We’ve all been played. We’ve all been tricked. It’s not exactly the oldest trick in the book, but it’s certainly a very old one. We’ve been tricked into thinking the UK was ashamed of its recent record of deportations and racist targeting of migrants, but we were wrong. We thought this, because the UK had come under such fire for its ‚hostile environment‚ policies, and its handling of the Brexit process. We thought that policy makers and government institutions were embarrassed and ashamed enough to set themselves on a course of correct action. The truth is, nothing has really changed. Take Dean Ablakwa. A former NHS nurse who was born in the UK was recently deported to Ghana for being unable to provide his passport to authorities (he has legitimate reasons). Nevermind that Mr. Ablakwa has no criminal record, has paid his taxes, is a model citizen etc. etc. ; the last decade of UK settlement policy, to make life difficult, even inhospitable to those considered undesirable, lingers on. Anyone is considered undesirable if they weren’t born in the UK, or in the case of Mr. Ablakwa, were born in the UK but cannot prove it. 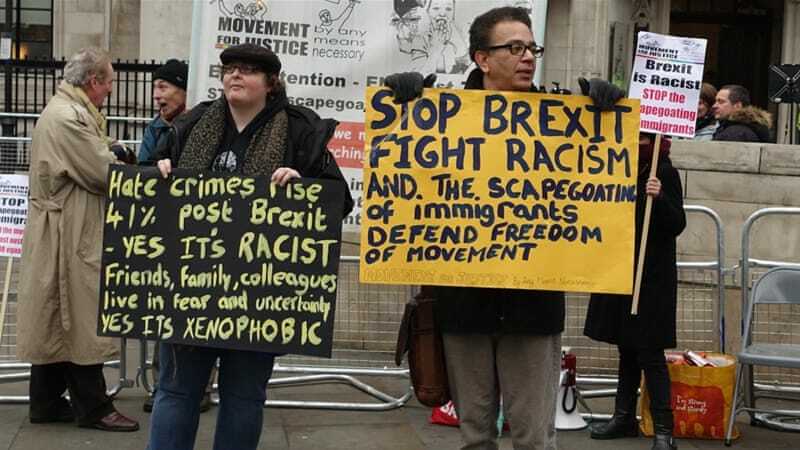 Ten years of people being hunted down by police and anti-migrant squads (despite all the economic and cultural benefits migrants have brought to the UK); ten years of people being deported who helped build modern Britain. The policy termed the ‚hostile environment‘ was first put in place by David Cameron’s Conservative government, spearheaded by then home secretary, now Prime Minister, Theresa May. It is no surprise that Brexit reflects her mindset and attitude, and has made migrants its primary target. However, with intense scrutiny placed on her government in recent months, in relation to both Brexit and the Windrush Scandal, it seemed as though the government would ashamed enough to behave better. We all believed that they would, since in times past, political scandal has normally led to changes. The public simply has not tolerated continued and shameless abuse of their trust. However, when it comes to migration, the UK has made all the public mea culpas possible, and continued to target migrants. It tricked us all. By saying ’sorry, yes, we admit we did something racist‘, we thought the British government’s behaviour would improve; but they were just words. The UK tricked us all by acknowledging its sin, and then committing it again and again. Earlier this winter, a group of activists termed the ‚Stansted 15‘ stopped the deportation of migrants by blocking the planes from taking off. These 15 people were tried under terrorist laws, and many will not be free for years to come. In its strange way, Brexit points to some issues of migrant targeting, and in doing so, conceals more serious cases. Horrible instances of Brexit preventing Dutch and German professionals from remaining in the UK, in their strange way, prevents stories like Mr. Ablakwa’s and the Stansted 15’s being told. The British government must be gleeful at the trick: point to a crime to conceal a bigger one. The UK’s image of a liberal and tolerant country should forever be shredded. It is opportunistic and racist; a path that we know never ends well.